This is a nickel free adjustable copper magnetic ring. It has a 1500 gauss neodymium rare earth bio north facing magnet on each end. It will fit small to medium finger ring sizes about 6 - 9. I bought two magnetic rings and I\'m very happy with them. They\'re extremely comfortable to wear and I couldn\'t beat the price. I intend to buy more from this website. This is the best customer service I have seen - anywhere! My first ring lost a magnet after only two weeks of wearing it. Not only did Magnet Jewelry Store replace the broken ring, they sent another which I just love! This is the way customers should be treated. I have worn copper jewelry for many years for arthritis in my hands. 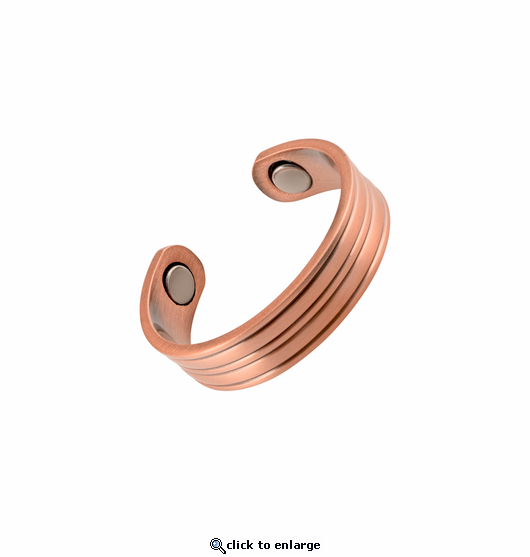 Magnet Jewelry Store is my new go to for purchasing copper and magnet jewelry. This ring is fantastic! My husband has an arthritic finger that improved greatly from an all magnet ring he had that broke. So glad to find this combination copper/magnet. The copper is finished beautifully and he can't be comfortable without it. I type all day and have arthritis throughout my body. Some days my hands just ache and the rings seem to stop the aching. I'm so grateful the magnets (and perhaps the copper) work to reduce my pain. I'm also happy that the ring looks good and no one knows it's anything but an attractive ring. His only complaint is that he can't get it big enough for the finger with the arthritis in it, he still wears it on his little finger. Reply by MJS: We only offer the ring in the one size stated in the description to fit finger ring sizes about 6 - 9. We are glad to accept return or exchange if you wish. Lines copper and magnetic ring. I am enjoying this ring and it certainly seems to be helping the pain in my finger. It was easy to adjust to the size needed to fit me. Was quite happy with the ring. Very attractive. Would recommend this site to anyone who is interested in purchasing magnetic jewelry! The rings are exactly as they were pictured, and they arrived on time. They were a gift and the person I gave them to loves them and said they are very comfortable. I love the ring I bought several to use on several fingers. help with pain in fingers. I love this product,thank you!